The average auto insurance rates for a Chevrolet Silverado LTZ Extended Cab 4WD are $1,466 annually including full coverage. Comprehensive insurance costs around $340, collision insurance costs $604, and liability costs $364. Buying just liability costs as little as $430 a year, and insurance for high-risk drivers costs $3,160 or more. Teen drivers cost the most to insure at up to $5,340 a year. For the normal driver, Chevrolet Silverado LTZ Extended Cab 4WD insurance rates range from as cheap as $430 for the bare minimum liability coverage to a much higher rate of $3,160 for a driver who requires high-risk insurance. These price differences highlight why anyone shopping for car insurance should compare rates for a specific zip code and their own personal driving habits, instead of making a decision based on price averages. Insurance rates for a Chevrolet Silverado LTZ Extended Cab 4WD also range considerably based on the model year, your driving characteristics, and deductibles and policy limits. Your home state makes a big difference in Chevrolet Silverado LTZ Extended Cab 4WD insurance prices. A 40-year-old driver could pay as low as $1,060 a year in states like , Indiana, and North Carolina, or as much as $1,950 on average in Michigan, Montana, and Louisiana. Rates by state and city are shown later in the article. Because prices have so much variability, the best way to figure out your exact price is to compare prices from multiple companies. Every company uses a different rate calculation, so the rates will be varied between companies. 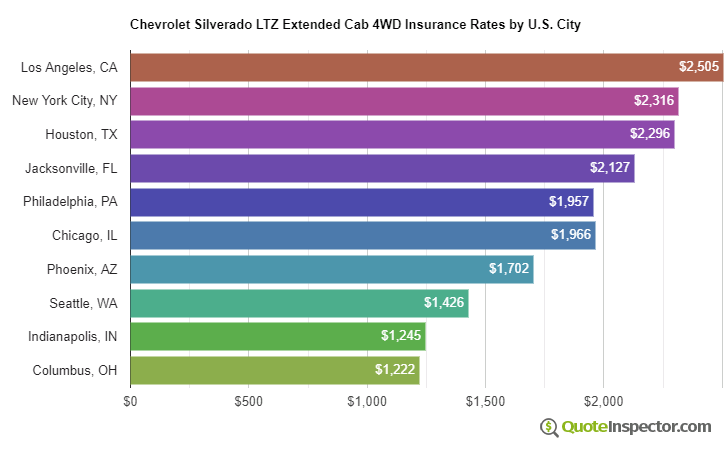 The chart above shows average Chevrolet Silverado LTZ Extended Cab 4WD insurance prices for various situations. The cheapest discount price is $841. Drivers who choose higher $1,000 deductibles will pay about $1,250. The average price for a driver age 40 with no violations using $500 deductibles is $1,466. 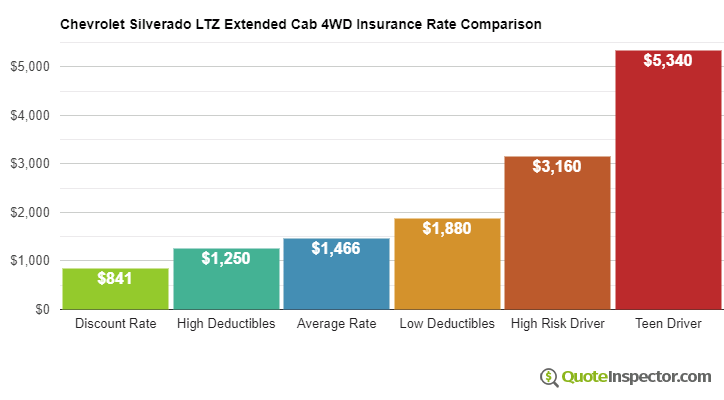 Using more expensive $100 deductibles for collision and other-than-collision coverage can cost as much as $1,880. High risk drivers could be charged around $3,160. The price for full coverage for a 16-year-old driver is $5,340.